Two family-owned Scottish treasures, who put ingredients, passion and taste at the heart of what they do, picturesque Glengoyne Distillery and the fabled Monachyle Mhor hotel, are offering two exceptional culinary travel breaks, perfect for the ultimate food and whisky lover. 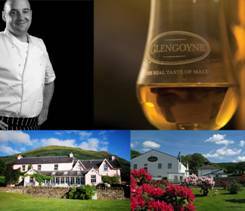 The packages, designed to embody Glengoyne’s ‘Real Taste of Malt, Real Taste of Food’ credentials, are available as a one night break from £280 per couple or a two night Master Class packed with fine food and rare whisky from £684 per couple. The Mhor Food and Whisky Master Classes have been designed with the food-loving whisky fan in mind. Taking food and whisky pairing to the next level, this exclusive two-night break includes not only the finest food the area has to offer but a taste of Glengoyne’s oldest, rarest and most valuable whisky – The Glengoyne 40 Years Old, worth over £200 per dram! Hosted by renowned chef, Tom Lewis, and Glengoyne Brand Heritage Manager, Stuart Hendry, these special events encompass the finest seasonal ingredients from Mhor hill farm, cottage garden and shooting estate, old and rare Glengoyne whiskies, great wine and a touch of fun. Evening meal at Monachyle Mhor, hosted by Stuart Hendry and introduced by Tom Lewis, pairing the best local ingredients that Scotland has to offer with Glengoyne whiskies and Glen Guin wines, another quality brand with its history rooted in the local area. These very exclusive, two night special events take place four times per year on 6 March, 16 June, 8 September and 10 November with prices starting from £684 per room based on two sharing. Alternatively, the one night Whisky, Food and Mhor break includes dinner, bed and breakfast at the sumptuous Monachyle Mhor Hotel. On arrival at the hotel enjoy a dram of the exceptional Glengoyne 21 Years Old Highland Single Malt Scotch Whisky, together with a traditional Scottish Black Bun specially created by Mhor to complement the rich honey flavours of the whisky. The following day guests make their own way through the picturesque Trossachs for a unique experience at Glengoyne Distillery. The Master Blender Session will guide enthusiasts through the distillery and into the spectacular Sample Room where each guest will create their very own unique blend with a word of encouragement or two from the expert blender. The creation is then bottled to take home and enjoy. The one night Whisky, Food and Mhor break is available all year with prices starting from £280 per room based on two sharing. Glengoyne and Mhor are within easy reach of Glasgow and Edinburgh, set in the spectacular scenery of the Trossachs.